SI Precast continues its commitment to manufacture the highest quality precast concrete products and provide concrete solutions with our concrete underground storm shelters. SI Precast storm shelters are manufactured with 5,000# psi concrete and reinforced with 1/2” rebar on 12” centers combined with 10 gauge steel wire mesh. Steel stairs and railing are powder coated and an electrical port is provided for wiring. The reinforced steel door is constructed of 12 gauge steel, is powder coated, and has custom-designed, three point latching system with locking device that allows the door to be opened from the inside, even if the door is damaged or locked, providing a sense of security to you and your family. 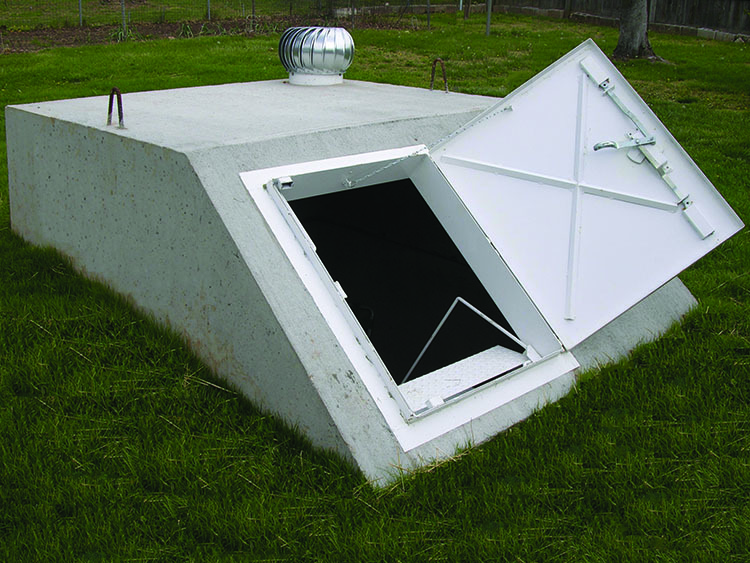 SI Precast Concrete storm shelters meet the rigid standards of the Federal Emergency Management Agency (FEMA) and also passed the stringent testing of the Wind Institute at Texas Tech University in September 2004. 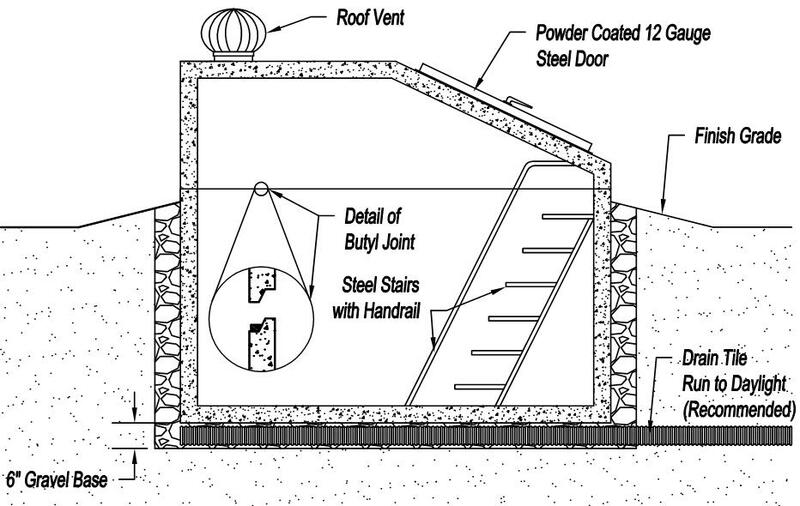 Need storm shelter installation instructions? Click here. Storm shelters are available in most locations. Call 888-262-7383 to check availability in your area. Visit our Resource Center for shop drawings of precast concrete undergrounf shelters and other products and a downloadable Product Catalog. Delivery available on all products. Excavate to a depth of fifty-two inches (52”) with a length of one hundred eleven inches (111”) and a width of eighty seven inches (87”). This allows for a six inch (6”) base of gravel and a three inch (3”) exposure of the base above ground. We recommend installing drain tile around the base of the shelter and running it to daylight to ensure proper drainage (see detail). If daylight is not an option, in good draining soil, excavate an additional drainage pit and fill with free-draining aggregate. Compact soil before setting base. After shelter is set by SI Precast, slope soil away from the storm shelter. 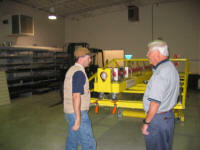 SI Precast will deliver and set your storm shelter and can provide a list of excavating contractors in your area. Click here to print installation instructions. Visit our Resource Center for shop drawings of products and a downloadable Product Catalog. On September 27, 2004, tests were conducted on the SI Precast concrete underground shelter door assembly in the Debris Impact Facility at Texas Tech University. Tests were consistent with FEMA 320 (Taking Shelter from the Storm) guidelines requiring shelter doors resist a 15 pound missile propelled at 100 m.p.h. The missile speed correlates to the missile being propelled by a 250 m.p.h. ground speed tornado. SI Precast’s shelter door passed the test and received approval from the Wind Engineering Research Center at Texas Tech University. Engineers at Texas Tech prepare to conduct the testing on the shelter door.